All prints are printed on lustre paper. Other sizes available - just ask! All kinds of sizes...5x5, 8x8, 12x12, etc. for sizes 10x13 and up. The prices are listed below. A styrene mount is a plastic mounting board 2mm thick. Standard color is white. 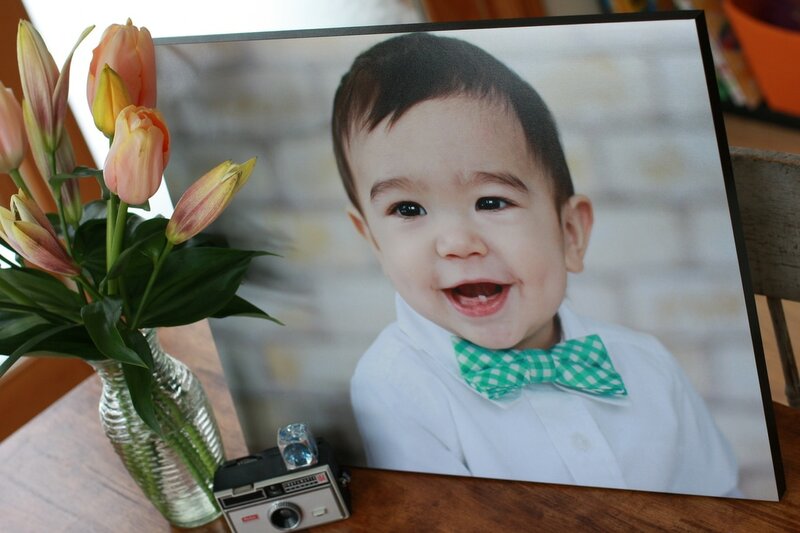 This is the best way to keep your photo stiff to prevent bending and tears. It also works great for photos going into an Organic Bloom Frame that has no glass in front. BIG Package = BIG Savings! Any a la carte item can be added onto any of these packages if you wish to increase the quantities or sizes. 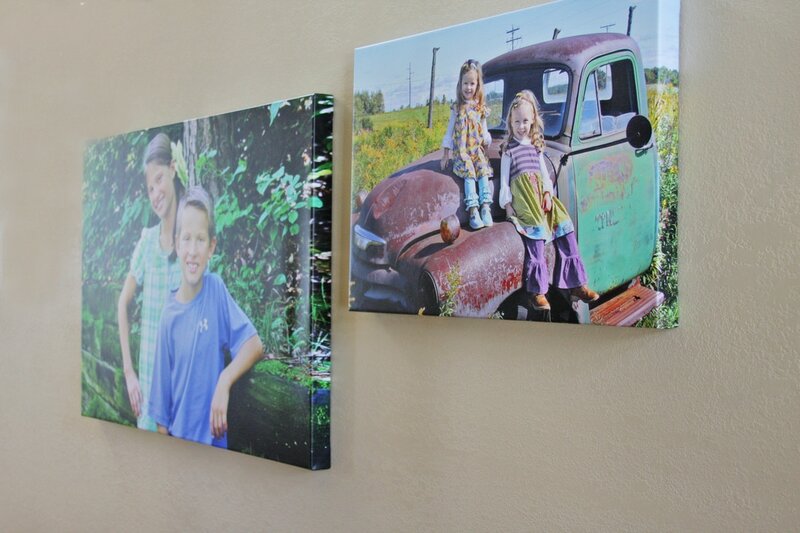 Your prints can be added to a canvas, which is a great way to make your photos "pop" off of the wall! 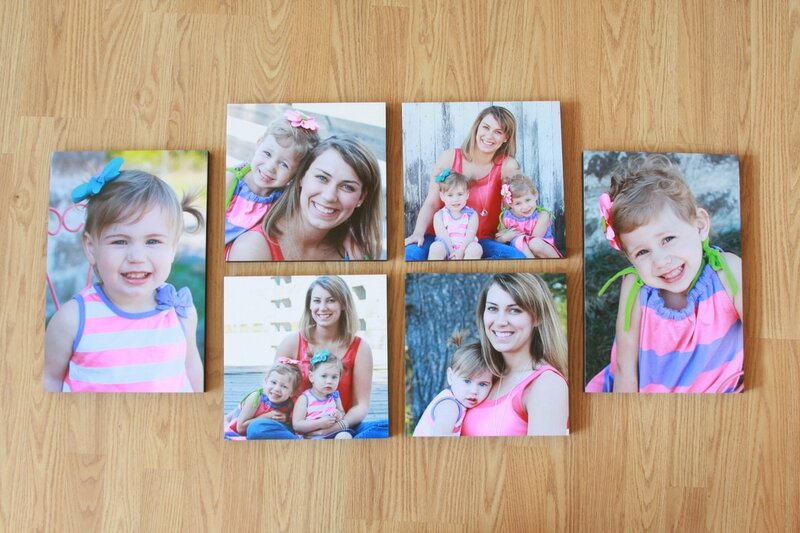 Canvas prints come as a gallery wrap canvas. 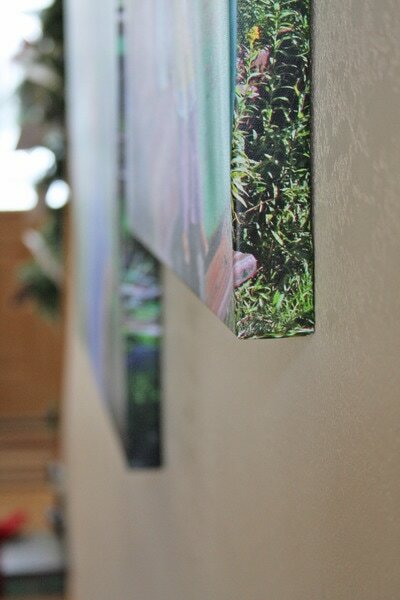 A gallery wrap is where the photograph wraps around the edge of the canvas. It comes in 1 1/2" depth off of the wall. 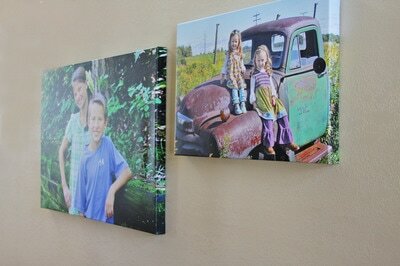 Pictured here left to right: 24"x36" 1 1/2" canvas and 16"x20" 1 1/2" canvas. Other sizes are available...just ask and I can get you a quote! Your picture can also be added to a black 3/4" standout mount. The standout mount is a thick lightweight board with a black plastic edge and comes ready to display with hanging holes on the backside. 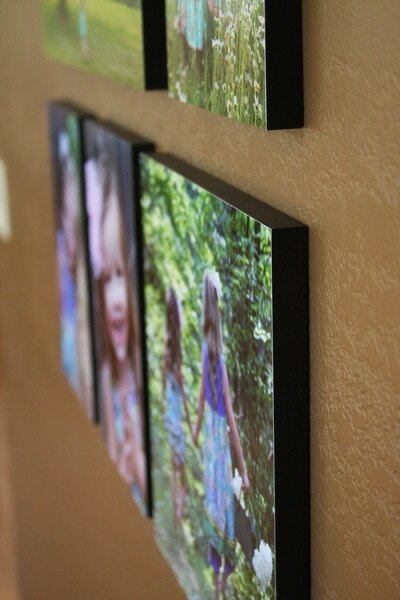 It's an easy way to hang your photo on the wall without framing it. The pictures below are various sizes to create a grouping. You can make quite a statement by mounting them in a grouping! Find which package you did when you first booked your session to determine the cost of the digital files. You can purchase all of your edited digital proofs from your session with a print release to print on your own. However, I do not guarantee that your photos will look the same as your proof book when they are printed somewhere else. Please be cautious about where you print your photos. Printing them at a Walmart or Walgreens will change the look and quality of the photo. I take pride in my photos and quality printing so please feel free to order prints from me to guarantee the quality. When they are printed somewhere else the quality can diminish my name. Sweet Child of Mine still owns the copyright to use the photos as advertising material. How much fun would it be to share your photos as a magnet with friends & family! They could hang them on their refrigerators all year long! A DVD slideshow of all of your pictures can be put on a DVD for you to show at your birthday party, baptism, graduation, or any other occasion! Music will be added to the DVD as well. Specific music requests are accepted. The high end DVD case is made with a photo print wrapped around hardboard and has a magnetic closure. A great memory to share at your family & friends! A beautiful keepsake to keep for years to come and show off to family and friends at your graduation party! The printed albums come in three sizes and have hinged binding so they lay flat when viewing. The album will include a variety of pictures from the session!